Like all National Parks, Acadia has an interesting history. It was originally private property donated by wealthy philanthropists to the government for the purpose of establishing the park. It became a National Park in 1919 as “Lafayette National Park” but had its name changed about a decade later to Acadia National Park. A map of the park looks a bit like Swiss cheese, as a lot of land that would seemingly be within the park is still privately owned. This made it much easier for us to visit during the federal government shutdown of 2013, as public, non-federal roads remained open. One of the early champions of Acadia National Park was John D. Rockefeller, Jr. Per Acadia: The Complete Guide, he and other affluent individuals used Acadia area as a way to escape the hustle and bustle of New York City, and wanted Acadia preserved as such. This became an area of contention between the New Yorkers and normal residents of the area, who didn’t want to be left behind as an undeveloped “rustic” area. The affluent sought to keep in place a long-time automobile ban on Mount Desert Island, whereas locals wanted vehicles on the island. While Rockefeller himself wasn’t keen on automobiles, he saw the writing on the wall and thought development of Acadia would be a positive thing if well-managed. He became an advocate for Park Loop Road (for vehicles) as well as the Carriage Roads (for carriages and pedestrians), and ultimately financed and directed the construction of both Park Loop Road and the network of carriage trails throughout Acadia National Park. Were it not for Rockefeller, these carriage roads wouldn’t exist. That would definitely be too bad, as they’re great for walking or jogging. I had a nice time taking leisurely photo walks along them, and most offered some great scenery. Please click the photo for best viewing (larger and in lightbox mode). From there, you can purchase prints by clicking the shopping cart at the top of the screen. You can also navigate to the 2,000+ other images in my photo galleries from there! Photographed with a Nikon D600 and the Nikon 14-24mm f/2.8 Lens. This was a single exposure, and proved to be a tough edit due to the range between the shadows and highlights. I didn’t want the leaves and mountains beyond the lake too be too blown out, but I also wanted plenty of light in the foreground. To complicate matters further, I wanted the long shadows of the trees on the ground pronounced, as I felt that gave the photo more visual texture. In photo editing, these things are sort of contradictory (for lack of a better term). However, I think I was able to strike a good balance. I substantially tamed the highlights in Adobe Camera Raw while opening up the shadows big time. (+100 for shadows and darks sliders.) This left me with a photo with a ton of dynamic range displayed, but that was also very grey, and lacking in contrast or pop. To combat this, I opened the photo in Photoshop CS6 and did significant curves adjustment to the entire image, which helped a lot, but still wasn’t quite enough. I then did another curves adjustment, this time only applying it to the ground for even more contrast. In addition to these edits, I also increased vibrance and brightness via adjustment layers, and also fixed the color (skewing a bit towards red) with a color balance adjustment layer. 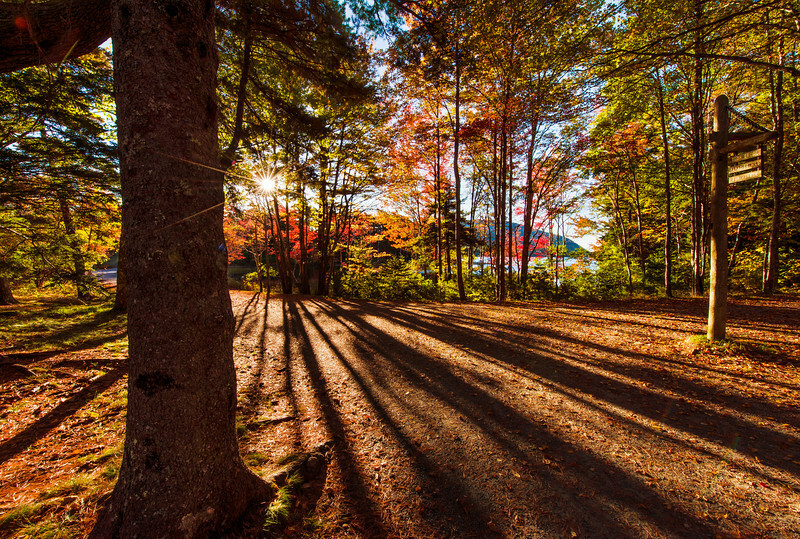 Have you ever been on the Acadia National Park Carriage Roads? What do you think of this photo? Hearing from you is half the fun, so please share your thoughts in the comments! Fantastic website. Plenty of helpful information here. I’m sending it to a few friends ans also sharing in delicious. It has been about 10 years since I have been to Acadia, your beautiful photos inspired me to put in on the calender for a weekend this spring! I don’t think you can do the same types of curves adjustment in Lightroom as you can PS. You can definitely adjust them, but not with an eyedropper (at least I don’t think so–I only use Adobe Camera Raw).